Jjolmyun refers to either a type of Korean noodles that have a very chewy texture and are made from wheat flour and starch or a cold and spicy dish made with the noodles, half boiled egg, and vegetables. Vegetables may include but not limited to cucumber, carrots, bean sprouts and shredded cabbage. The spicy and hot sauce is a combination of gochujang (chili pepper paste), vinegar, sugar, and minced garlic. 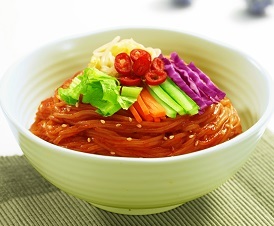 It is also a type of bibim guksu, also known as mixed noodles in Korean and it's especially popular during the summer season. This dish is one of the most popular noodle dishes in South Korea, especially among young people at bunsikjeom or Korean snack restaurant. It is a representative dish of Incheon, where it originated in the early 1970s by mistake while attempting to make naengmyun.